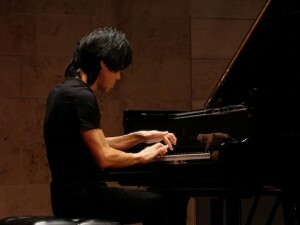 Taka Kigawa performing the complete solo piano works of Pierre Boulez at New Music Gathering, San Francisco Conservatory of Music, January 2015. New Music Gathering 2015 featured performances by musical mavericks at an enterprising conference. With much of the classical music here focused on the starry 70th-birthday celebration that the San Francisco Symphony threw for its music director, Michael Tilson Thomas, it would have been easy to miss New Music Gathering 2015, a feisty, hybrid festival and conference that last Thursday through Saturday took over the San Francisco Conservatory of Music, just a short walk down Van Ness Avenue from Davies Symphony Hall. The Gathering was assembled by four Brooklyn, N.Y., composers—Lainie Fefferman, Daniel Felsenfeld, Mary Kouyoumdjian and Matt Marks—who hope to make it an annual event, probably in a different city each year. For this inaugural installment, they brought along several New York performers, most notably the flutist Claire Chase, the driving force of the enterprising ensemble ICE (and the winner of a MacArthur Foundation Fellowship in 2012), and the powerhouse pianist Taka Kigawa, who was on hand to play all of Pierre Boulez’s piano music—three Sonatas, the Notations and a few smaller works, 90-minutes of densely abstract music, all told—in one sitting, with no intermission, and from memory. They also enlisted stars from San Francisco’s new-music firmament, including the Kronos Quartet, which held an open rehearsal of Terry Riley’s “The Cusp of Magic” at the Center for New Music, as well as the pianist Sarah Cahill, the inventive choral group Volti, and fresh young ensembles like Wild Rumpus that are not yet well known in the East. If Mr. Thomas had not been otherwise engaged, it might have been just his cup of tea, given his fascination with musical mavericks. The Gathering took over the school’s three concert and rehearsal halls, and a couple of the classrooms, from 10 a.m. to 10 p.m., offering panels, lecture-demonstrations and performances. Usually, there were three presentations to choose from at any time, and choosing was tough. For example, Friday afternoon’s offerings—a panel on combining ritual movement with music; a demonstration of a new electronic instrument by Roger Linn; and a roundtable on how musicians can use social media, on new ensembles with unusual missions (the Nouveau Classical Project, which combines music and fashion, for example), and on the ways boards of directors work in the performance world—competed directly. Some presentations were technical tip sessions for like-minded colleagues. Ryan Carter, of Headless Monkey Attack, explained the computer code he used for “Latency in the System,” a vivid, driven score for electronics and drums, with a performance included. Dan Iglesia made a pitch for developing software to make music on mobile devices, and his Sideband Mobile Quartet played a few scores that showed that your iPad is ready for prime time, as an instrument. Networking was high on the agenda. Apart from a “therapy room,” where participants could discuss professional problems—how to find a manager, for example—there was a Friday morning composer-performer speed-dating session. Chairs were arranged in two circles, facing each other, with composers keeping their seats in the outer circle while performers, in the inner circle, shifted to the left every three minutes. Armed with laptops, tablets and smartphones, both groups played each other their work and looked at scores, to be explored further later if the chemistry seemed right. Performances were plentiful, and varied. Although the Brooklyn environs where the Gathering’s directors work is ground zero for indie classical music, in which currents of classical, pop, jazz and the avant garde mingle, Mr. Felsenfeld said that he did not want the concerts limited to a single musical style. So Mr. Kigawa’s sharp-edged, exquisitely transparent rendering of the Boulez canon (which won whistles and shouts) was offered on Friday, shortly after Joo Won Park gave an amusing recital of live electro-acoustical works in which his instrumentarium included Lego pieces, chattering teeth and a Slinky, and just a few hours before Ms. Cahill’s tribute to Mr. Riley’s 80th birthday, with scores by Mr. Riley (who was present) and several younger composers who paid tribute to, and built upon, his rippling, Minimalist style. Among the other musical highlights, Ms. Chase presented, on Thursday, an installment of her “Density 2036” project, for which she is commissioning new scores for solo flute and electronics, leading up to the centennial of Edgard Varèse’s seminal “Density 21.5” (which she also played, hauntingly). The same evening, the composer Eve Beglarian, the violinist Mary Rowell and the guitarist Giacomo Fiore performed blues- and folk-tinged, electronically processed works that Ms. Beglarian wrote as part of her “River Project,” a composing journey down the Mississippi River. But it was the panels and discussions that made the Gathering into something more than just another new-music festival, which are plentiful now. Contentiousness was largely—but not entirely—avoided. Composers and singers sniped a bit about one another (“they won’t sing it the way I wrote it” versus “they want me to sound like someone else”) during a session on writing new vocal music. And during a discussion in which representatives of Alarm Will Sound, ICE and the Kronos Quartet spoke about what makes their groups tick, a listener asked what those ensembles—all iconoclastic newcomers once, now solidly established—do to stay relevant. Perhaps out of politeness, no one bristled at the fatuousness of the question, now a common trope in discussions about classical music. Music’s relevance, of course, is not a function of age or style, but of its ability to grab a listener, momentarily alter reality, and offer a glimpse of the transcendent. That is what these three ensembles—along with Mr. Kigawa, Ms. Cahill and many of the composers on hand—do pretty consistently. What the Gathering offered, as well, was a glimpse at how that magic happens.